The state’s largest labor federation, the Minnesota AFL-CIO, hired Todd Dahlstrom as director of organizing and growth and Bill Breon as coordinator of the Path to Power program this month. Path to Power is the state federation’s new effort to support union members running for public office, ensuring that working Minnesotans have more voice in local government affairs. Prior to joining the Minnesota AFL-CIO, Breon did issue-based organizing for affordable housing, renewable energy, and marriage equality. He has worked for the city of Minneapolis and taken part in well over a dozen municipal elections in the last ten years. Dahlstrom, a St. Paul resident, will assist the Minnesota AFL-CIO’s affiliate unions in extending union membership to more working Minnesotans. “Minnesota’s unions are increasingly hearing from workers who want a voice at work and have asked their state federation to provide support in organizing efforts,” Knutson said. Dahlstrom worked for 10 years as lead organizer of Local 26 of the Service Employees International Union. “Minnesota unions are stepping up in their organizing efforts to improve the lives of working Minnesotans, and I’m excited to support their work,” Dahlstrom said. 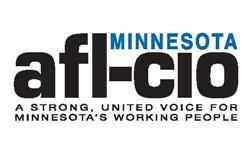 The Minnesota AFL-CIO is the state’s largest labor federation, representing more than 300,000 members of 1,000-plus local unions across the state.